Below some more details on the books that I have co-authored or co-edited. Florian Daniel and Maristella Matera. Mashups: Concepts, Models and Architectures. Springer, 2014. ISBN 978-3-642-55048-5. Finally, we officially concluded the work on our new book on mashups and submitted all our material to Springer for final print and publication. The book is expected to be available online and in book stores in July/August 2014. Have a look at Springer or Amazon or at the product flyer. Cover text. Mashups have emerged as an innovative software trend that re-interprets existing Web building blocks and leverages the composition of individual components in novel, value-adding ways. Additional appeal also derives from their potential to turn non-programmers into developers. Daniel and Matera have written the first comprehensive reference work for mashups. They systematically cover the main concepts and techniques underlying mashup design and development, the synergies among the models involved at different levels of abstraction, and the way models materialize into composition paradigms and architectures of corresponding development tools. The book deliberately takes a balanced approach, combining a scientific perspective on the topic with an in-depth view on relevant technologies. 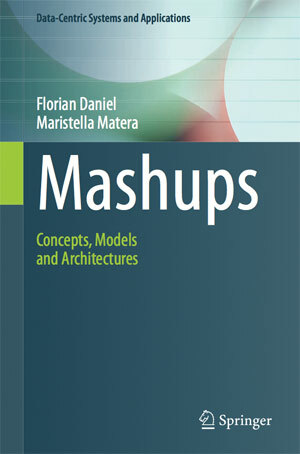 To this end, the first part of the book introduces the theoretical and technological foundations for designing and developing mashups, as well as for designing tools that can aid mashup development. The second part then focuses more specifically on various aspects of mashups. It discusses a set of core component technologies, core approaches, and architectural patterns, with a particular emphasis on tool-aided mashup development exploiting model-driven architectures. Development processes for mashups are also discussed, and special attention is paid to composition paradigms for the end-user development of mashups and quality issues. Important: we also prepared an accompanying website with teaching material, links and a discussion forum that allows everbody to easily provide feedback and to comment on the book. Sven Casteleyn, Florian Daniel, Peter Dolog and Maristella Matera. Engineering Web Applications. Springer, August 2009, ISBN 978-3-540-92200-1. 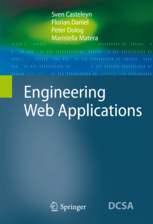 Eventually, in July 2009 we finalized our book entitled "Engineering Web Applications" and published by Springer, an achievement we are particularly proud of. The book is a monograph on the state of the art and on future trends in Web Engineering research and is targeted at students, teachers, and researchers. It tooks us quite a while to agree on all topics and on how to present them, but in the end we could manage to assemble a book that I think is worth having a look at. Cover text. Nowadays, Web applications are almost omnipresent. The Web has become a platform not only for information delivery, but also for eCommerce systems, social networks, mobile services, and distributed learning environments. Engineering Web applications involves many intrinsic challenges due to their distributed nature, content orientation, and the requirement to make them available to a wide spectrum of users who are unknown in advance. The authors discuss these challenges in the context of well-established engineering processes, covering the whole product lifecycle from requirements engineering through design and implementation to deployment and maintenance. They stress the importance of models in Web application development, and they compare well-known Web-specific development processes like WebML, WSDM and OOHDM to traditional software development approaches like the waterfall model and the spiral model. Important problem areas inherent to the Web, like localization, personalization, accessibility, and usage analysis, are dealt with in detail, and a final chapter provides both a description of and an outlook on recent Semantic Web and Web 2.0 developments. Overall, their book delivers a comprehensive presentation of the state-of-the-art in Web application development and thus forms an ideal basis for academic or industrial courses in this or related areas. It is equally suitable for self-study by researchers or advanced professionals who require an overview on how to use up-to-date Web technologies. Table of contents. Preview here the preface, table of contents and introduction. Florian Daniel. Context-Aware Web Applications: The Model-Driven Way. VDM Verlag Dr. Müller, February 2010, ISBN 978-3639113938. Have a look at Amazon, if you're interested in buying it. Cover text. This book describes a methodological, model-driven approach to context-awareness and adaptivity in the field of Web Engineering and is based on the dissertation "Model-Driven Design of Context-Aware Web Applications" by the author. The described modeling approach is one of the first attempts to enlarge the applicability of adaptive application features in the Web from so-called "adaptive hypermedia systems" to "context-aware Web applications". While the former typically are based on a user model that is dynamically updated based on the observation of the user's navigation actions, the latter are based on a more complex context model and active, context-triggered application features. The research described in this book is applied in the context of WebML (the Web Modeling Language), yet its contribution is general in nature and can be ported to other modeling languages as well. Athman Bouguettaya, Quan Z. Sheng and Florian Daniel (Eds.). Web Services Foundations. Springer, July 2013, ISBN 978-1-4614-7517-0. Athman Bouguettaya, Quan Z. Sheng and Florian Daniel (Eds.). Advanced Web Services. Springer, July 2013, ISBN 978-1-4614-7534-7. This book is the second installment of a two-book collection covering the state-of-the-art of both theoretical and practical aspects of Web services and SOC research and deployments. 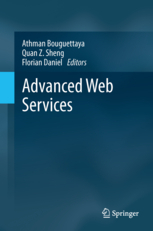 Advanced Web Services specifically focuses on advanced topics of Web services and SOC and covers topics including Web services transactions, security and trust, Web service management, real-world case studies, and novel perspectives and future directions. 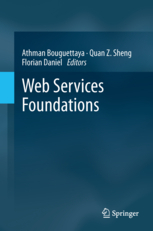 The editors present foundational topics in the first book of the collection, Web Services Foundations (Springer, 2013). Together, both books comprise approximately 1400 pages and are the result of an enormous community effort that involved more than 100 authors, comprising the world’s leading experts in this field. Marta E. Zorrilla, Jose-Norberto Mazon, Oscar Ferrandez, Irene Garrigos, Florian Daniel and Juan Trujillo (Eds.). 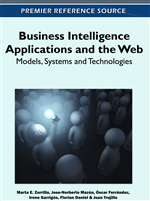 Business Intelligence Applications and the Web: Models, Systems and Technologies. IGI Global, September 2011, ISBN 9781613500385. This volume summarizes current research advances in BI and the Web, emphasizing research solutions, techniques, and methodologies which combine both areas in the interest of building better BI solutions. The aim is to emphasize the interconnections that exist among the two research areas and to highlight the benefits of combined use of BI and Web practices, which so far have acted rather independently, often in cases where their joint application would have been sensible. This book constitutes revised papers from the eight International Workshops held at the 16th International Conference on Business Process Management, BPM 2018, in Sydney, Australia, in September 2018: BPI 2018, BPMS2 2018, PODS4H 2018, AI4BPM 2018, CCBPM 2018, BP-Meet-IoT / PQ 2018, DeHMiMoP 2018, REBM /EdForum 2018. The 45 full papers presented in this volume were carefully reviewed and selected from 90 submissions. Florian Daniel and Martin Gaedke (Eds.). Rapid Mashup Development Tools. 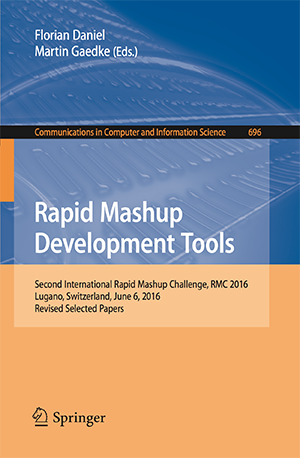 Rapid Mashup Development Tools - Second International Rapid Mashup Challenge, RMC 2016, Lugano, Switzerland, June 6, 2016, Revised Selected Papers. Springer, CCIS 696, ISBN 978-3-319-53173-1. Florian Daniel and Cesare Pautasso (Eds.). Rapid Mashup Development Tools. 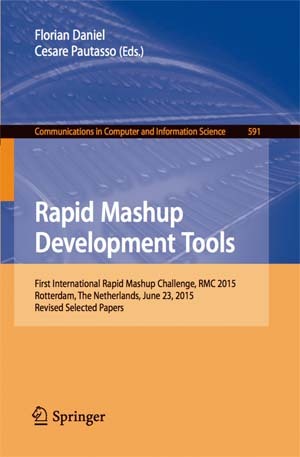 First International Rapid Mashup Challenge, RMC 2015, Rotterdam, The Netherlands, June 23, 2015, Revised Selected Papers. Springer, CCIS 591, ISBN 978-3-319-28727-0. This volume of proceedings contains the contributions that were presented in the context of the 1st International Rapid Mashup Challenge. The initial submissions were only 4 pages long and served to select contributions. The papers printed in these proceedings instead are long versions and provide the reader with a complete overview of the approaches proposed by the authors and of the mashups they developed during the challenge. Florian Daniel and Oscar Diaz (Eds.). Current Trends in Web Engineering. 15th International Conference, ICWE 2015 Workshops, NLPIT, PEWET, SoWEMine, Rotterdam, The Netherlands, June 23-26, 2015. Revised Selected Papers. Springer, LNCS 9396, ISBN 978-3-319-24800-4. 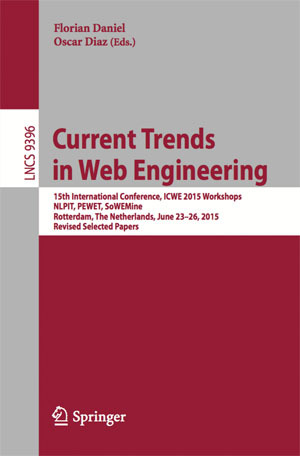 This book constitutes the thoroughly refereed post-conference proceedings of Current Trends in Web Engineering, ICWE Workshops 2015 which was held in June 2015 in Rotterdam, The Netherlands. The 16 revised full papers were selected form 23 submissions and cover topics on natural language processing for informal text, pervasive Web technologies, trends and challenges, and mining in the social Web. Florian Daniel, Jianmin Wang and Barbara Weber (Eds.). Business Process Management. 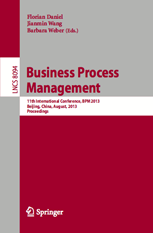 11th International Conference, BPM 2013, Beijing, China, August 26-30, 2013, Proceedings. Springer, LNCS 8094, August 2013, ISBN 978-3-642-40175-6. This book constitutes the proceedings of the 11th International Conference on Business Process Management, BPM 2013, held in Beijing, China, in August 2013. The 17 regular papers and 8 short papers included in this volume were carefully reviewed and selected from 118 submissions. The papers are organized in 7 topical sections named: process mining; conformance checking; process data; process model matching; process architectures and collaboration; as well as alternative perspectives, and industry papers. Florian Daniel, George A. Papadopoulos and Philippe Thiran (Eds.). Mobile Web and Information Systems. 10th International Conference, MobiWIS 2013, Paphos, Cyprus, August 26-29, 2013, Proceedings. Springer, LNCS 8093, August 2013, ISBN 978-3-642-40275-3. 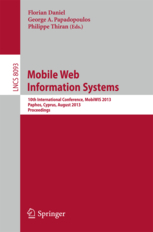 This book constitutes the refereed proceedings of the 10 th International Conference on Mobile Web and Information Systems, MobiWIS 2013, held in Paphos, Cyprus, in August 2013. The 25 papers (20 full research papers, 4 demonstration papers, and one abstract of the keynote speech) presented were carefully reviewed and selected from various submissions. The papers cover the following topics related to mobile Web and Information Systems (WISs), such as mobile Web services, location-awareness, design and development, social computing and society, development infrastructures and services, SOA and trust, UI migration and human factors, and Web of Things and networks. Florian Daniel, Peter Dolog and Qing Li (Eds.). Web Engineering. 13th International Conference, ICWE 2013, Aalborg, Denmark, July 8-12, 2013, Proceedings. Springer, LNCS 7977, June 2013, ISBN 978-3-642-39199-6. This book constitutes the refereed proceedings of the 13th International Conference on Web Engineering, ICWE 2013, held in Aalborg, Denmark, in July 2013. The 21 full research papers, 4 industry papers, and 11 short papers presented were carefully reviewed and selected from 92 submissions. The scientific program was completed with 7 workshops, 6 demonstrations and posters. The papers cover a wide spectrum of topics, such as, among others: web mining and knowledge extraction, semantic and linked data management, crawling and web research, model-driven web engineering, component-based web engineering, Rich Internet Applications (RIAs) and client-side programming, web services, and end-user development. Florian Daniel, Kamel Barkaoui and Schahram Dustdar (Eds.). Business Process Management Workshops. Clermont-Ferrand, France, August/September 2011 Revised Selected Papers, Part I and II. Springer, LNBIP 99/100, August 2011, ISBN 978-3-642-28107-5. Available from Springer (Part I, Part II). The two LNBIP volumes 99 and 100 collect the post-workshop proceedings of the 12 workshops help in conjunction with BPM 2011, from August 28 to September 2, 2011, in Clermont-Ferrand, France. I think both volumes are characterized by high-quality contributions, and that it's really worth having a look at them. Table of contents. Preview here the foreword/preface and table of contents of Part I and Part II. Florian Daniel and Federico M. Facca (Eds.). Current Trends in Web Engineering. 10th International Conference on Web Engineering ICWE 2010 Workshops, Vienna, Austria, July 2010, Revised Selected Papers. Springer, LNCS 6385, July 2010, ISBN 978-3-642-16984-7. This LNCS volume 6385 collects the post-workshop proceedings of the workshops and the doctoral consortium that have been organized in conjunction with the 10th International Conference on Web Engineering (ICWE), held from July 5-9 in Vienna, Austria. I think there are lots of interesting papers and new ideas in the volume that nicely complement the main conference. It's also worth having a look at the workshops' individual web sites. Table of Content. Preview here the foreword/prefaces and table of contents of the book.